Today is already day 4 of the blogging challenge. The prompt is, favorite quote and why you love it. This one was tough, as I have so many quotes I love. I even have a Pinterest board devoted to quotes I find that I want to remember, check out my words board here. I love this quote! I claim my weirdness from my mom's side of the family. We always says, "it just that (insert last name) weirdness," when any of us are doing something out of the ordinary. Why be ordinary when you can be weird and extraordinary? Now, I am not weird all the time. I sensor myself to only be weird around people I'm comfortable being around. I am considered an introvert (although can be an extrovert in certain circumstances when needed) and so I'm quiet and un-weird around people I do not know very well. If you have experienced my weirdness, consider yourself in the inner circle! B: you are so weird. Me: that is why you love me! 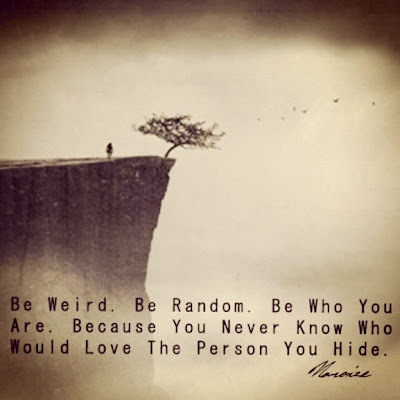 So on this rainy Saturday I encourage you to embrace your inner weird and let it shine. Do you consider yourself weird? If so I think we could be RLF (real life friends). For all you non-weird people, I can befriend you also if you can put up with my weirdness.